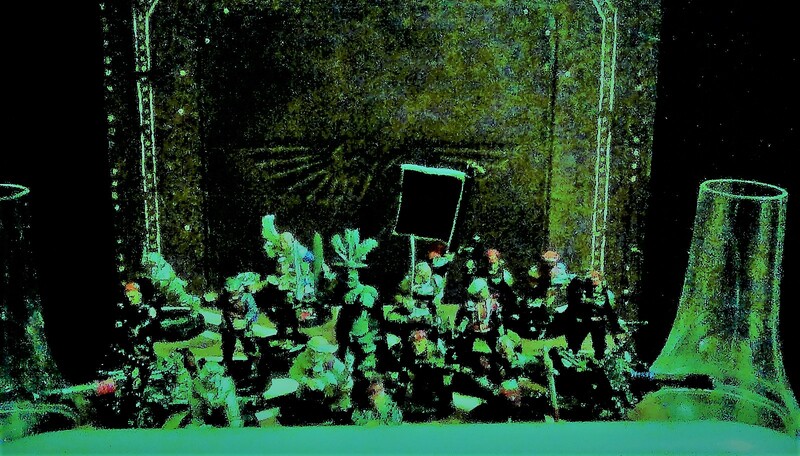 "Officers and Ratings of the Imperial Navy, I speak to you now from the gantry above the command deck in front of the bulkhead to our bridge of the Emperor Class - Imperial Dreadnought Battleship: Starchild's Grief; "The Imperium's Retribution"
I, The CIRO, Servant of His Imperial Majesty, and the Undying Emperor, I am here to introduce myself to you, my fellow unshaking Admirals, and the brave captains and crew under them, the darkness that threatens the Gothic Sector, will be burned away by the light of the Emperors plasma batteries, any world that sides with our enemy will see it's seas evaporate, and it's sky darken, as it's surface becomes as fiery as our fury, an inferno equaling the star of Segmentum Solar that shines on the places of Holy Terra, and on the Emperor Himself. We are unbowed, we are unswayed, The Heretic, Xenos and the Traitor will be brought to the Imperial Sword, and the Imperial Sword through them! "What do you mean the warp engines are overheating due to an rune input malfunction? You're interrupting my heroic speech to inspire us all to victory!" Heya, y'all, I'm the one in the big feathery sallet, I like history, strategy, armies, and will be signing up to the local PDF Division as soon as I am fit, I'm also a "f@ke gemer gurl." Cos this is the internet and there are no real girls on the internet.